Chrissy Teigen you genius. If you haven't heard of her recent cookbook, Cravings, then you may be living under a rock. Chrissy is wife to John Legend, momma to Luna, hot model and now, a New York Times Best Selling cookbook author. Cravings came out last Spring. The book's tagline is "recipes for all the food you want to it." It's just that. Page after page of recipes your everyday person actually wants to eat and make. When I received my copy, I did as I usually do with a new cookbook. I sat down with a stack of stickies going through marking each recipe I wanted to make. I read the book cover to cover. Like actually read all the little blurbs and antecdotes that no one usually reads. Chrissy writes the book like she is talking to her best friend, texting her husband or ranting on Twitter. She also has insane pictures of her in hot pink ballgowns, sitting on John's lap shoving hot dogs in his mouth as well as modeling bathing suits by the pool chowing down on chicken wings. She pulls it off, it's too good. After reading through the book I found myself with practically every page marked with a sticky. Yellow Cake Baked Oatmeal, Caprese Salad with Crispy Proscuitto, Mac and Cheese, Baked Pasta with Mozzarella Bombs, Steak Bites with Melty Blue Cheese Butter, Artichoke, Spinach and Buffalo Chicken Dip, Cheesy Guacamole, Chorizo Queso, Sh*t on Toast, and BTI (better than Ina's) Roast Chicken and Vegetables. SO much goodness in this book. The thing I couldn't wait to make though were these Summer Shrimp rolls. Those sticky rice paper fresh rolls you get before your meal at Thai places can now be made at home. I made these for dinner almost every night for dinner last week. They are so satisfy and perfect for a summer dinner. Kudos to you Chrissy for bringing the fire to the world of cookbooks. Rinse the lettuce leaves and pat dry. Remove and discard the center ribs then slice in half so you end up with 16, about 3 inch long pieces. Fill a saucepan halfway with water and salt the water. Bring to a boil over high heat. Add the shrimp and cook until pink, about 2 minutes. Turn the heat to low, take the shrimp out of the pot with tongs or a slotted spoon and rinse with cold water, pat dry. Cut off the tails and slice lengthwise. Place the rice noodles in the pot of still hot water to soften. Cook until soft. Remove and rinse in a colander under cold water. Create a workspace lined up with lettuce, herbs, carrots, avocado, shrimp and rice noodles. Fill a clean skillet or shallow bowl with warm water to soak the rice papers. Arrange a damp towel on your workspace. One at a time, dunk the rice papers into the warm water to soften. Remove from the water and run under cool water. They easily stick together, so the cool water is a good time to unstick them from themselves. Lay flat on the damp towel. To assemble: place 2-3 shrimp halves pink side down about 1/3 from the bottom, layer over mint and basil, then avocado, then carrots, rice noodles, then lettuce leaves. Roll up like a burrito by pulling up the bottom, tucking in the sides, then rolling till the end. The rice paper will stick together sealing it shut. Repeat with remaining rice papers. Serve immediately with the chili sauce. *If chili sauce is too spicy for you, you can tone it down by adding a little bit of lime juice and water. *The recipe says it makes 8 rolls, but it is easy to make less if you are cooking for one. I would eat 2-3 for dinner. The components last well in the fridge, so I would keep everything prepped, then just cook the shrimp, noodles and rice papers fresh each night and assemble just before eating! I've had the idea for this dish for a while, but just got around to making it. I don't know why it took me so long because the actual recipe cooks up in less than 15 minutes. This single girl/poor college kid/quick dinner dish totally elevates all the scenarios I just mentioned. 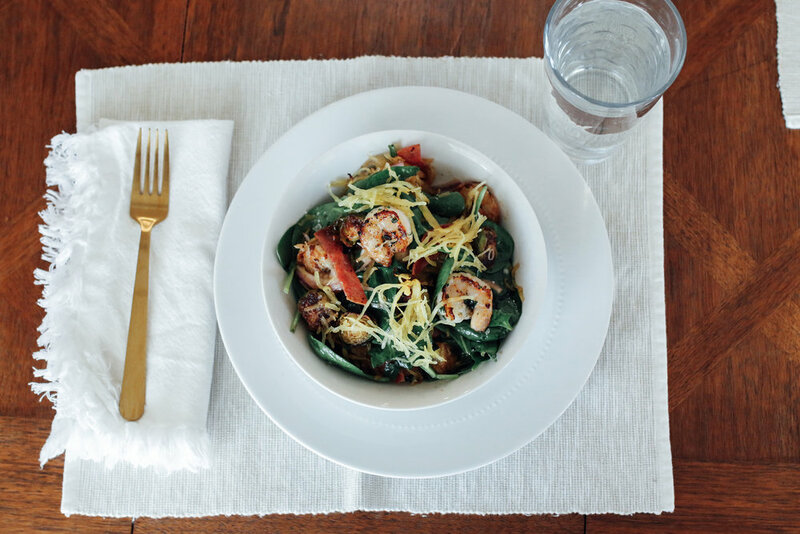 It's gourmet, cheap but super easy and definitely fits the bill for a satisfying dinner. Or brunch if you want to get fancy on a lazy Sunday morning. I recently discovered you can buy a box of instant grits just like instant oatmeal. Microwave oatmeal is a regular part of my daily routine, but now grits, oooooh man! Growing up I remember mom always asking, grits or oatmeal? It was always the decision between sweet or savory? Really because I would either douse my grits with a pound of butter or my oatmeal with a cup of brown sugar. The only problem was that I had to wait near 20 minutes for my breakfast to be ready. I don't have that kind of patience anymore, so hello to instant grits! Microwave grits, a little cheese and some frozen corn and shrimp make for an ulti single girl meal! The recipe is clearly for a single serving, but it would be super easy to double or triple. some type of cheese-Parmesan, Gouda, cheddar etc. If using frozen, make sure to first thaw your shrimp. I do this by running them under luke warm water until thawed. Heat your olive oil or butter in a small pan over medium heat. Add your corn and shrimp to the pan, throw in some garlic and a little bit of cayenne. Don't go to crazy on the cayenne, unless you like things spicy spicy! While your shrimp is cooking, microwave the grits according to package directions. It's probably something like add 1/2 cup of water and microwave for 1 minute. Stir in the cheese and season your grits with salt and pepper to taste. (I like mine really salty!) By now your shrimp should be cooked though. Take off the heat and squeeze lemon juice over the shrimp. 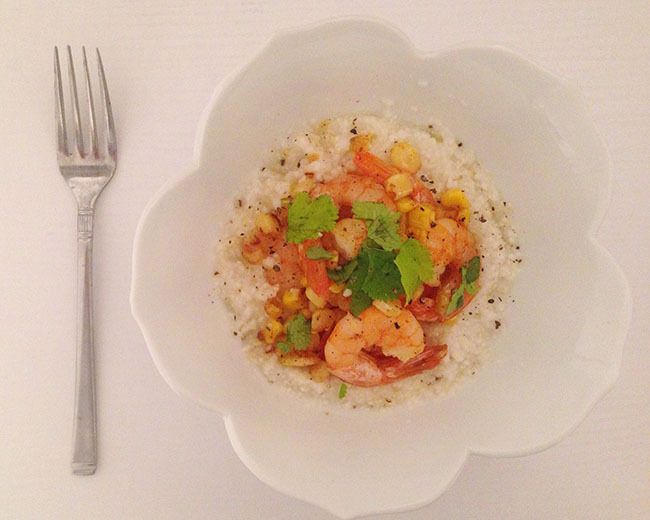 Pile the shrimp and corn over your cheese grits and garnish with chopped cilantro!